Her Majesty’s Australian Ship (HMAS) Melbourne, working for the Combined Maritime Forces (CMF) in the Middle East successfully intercepted a small cargo vessel, known as a dhow, smuggling 427 kilograms of heroin in the Indian Ocean, on 1 October 2015. The drugs, which have now been destroyed, had an estimated street value of $174 (US) million, a value based on an average purity of 60%, which is the approximate historic average seized in 2014. HMAS Melbourne keeps watch over an intercepted dhow in the Indian Ocean. HMAS Melbourne’s crew boarded the vessel and discovered 427kg of heroin that was confiscated and subsequently destroyed. HMAS Melbourne was working as part of the Combined Task Force (CTF) 150, under the command of Rear Admiral Moazzam Ilyas from the Pakistan Navy, and became wary of the dhow after it was observed to be operating suspiciously in the international waters of the Indian Ocean. The ship subsequently sent a boarding party via seaboat to conduct a routine boarding. HMAS Melbourne’s sea boats keep a watch over a dhow found to be smuggling 427kg of heroin across the Indian Ocean. Interviews with the dhow’s crew raised suspicion that it was potentially involved in some form of illegal activity. 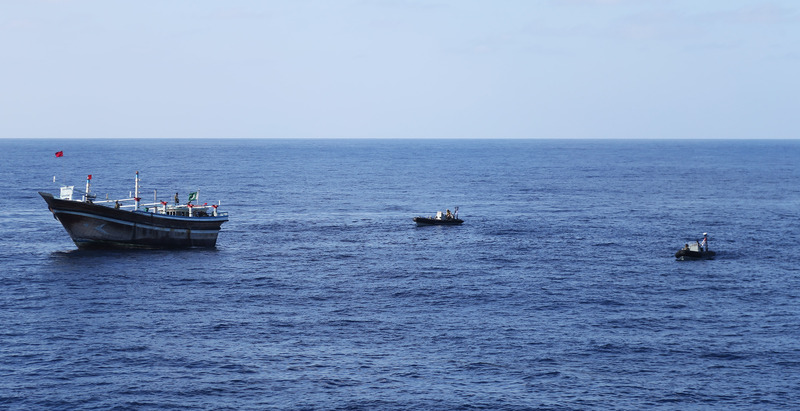 CMF approved a search of the vessel, which led to the discovery of approximately 427 kilograms of heroin. 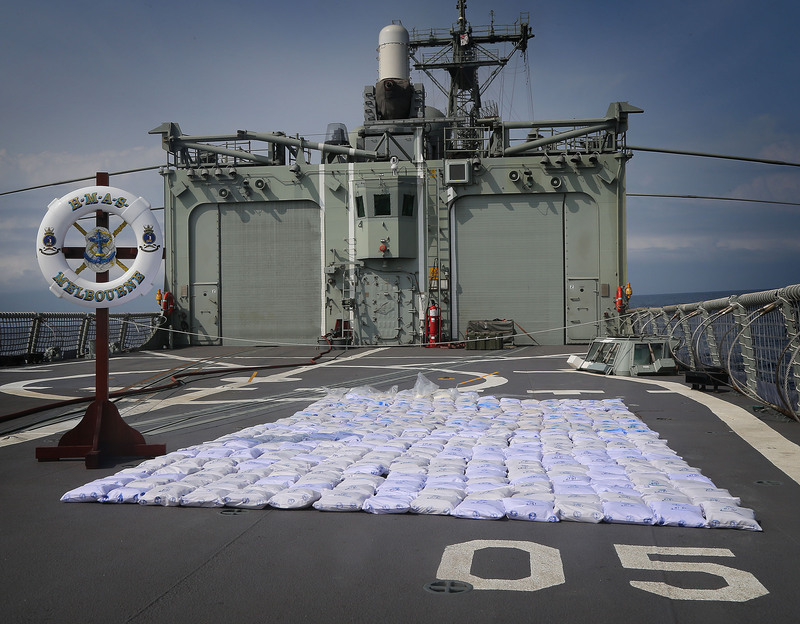 Seized illegal narcotics are seen on HMAS Melbourne’s flight deck prior to disposal. About 427 kilograms of heroin was confiscated from a dhow smuggling the illegal drugs across the Indian Ocean. The drugs were removed from the dhow onto HMAS Melbourne where they were analysed and then disposed of. In accordance with procedures the vessel and crew were released and allowed to continue their journey. 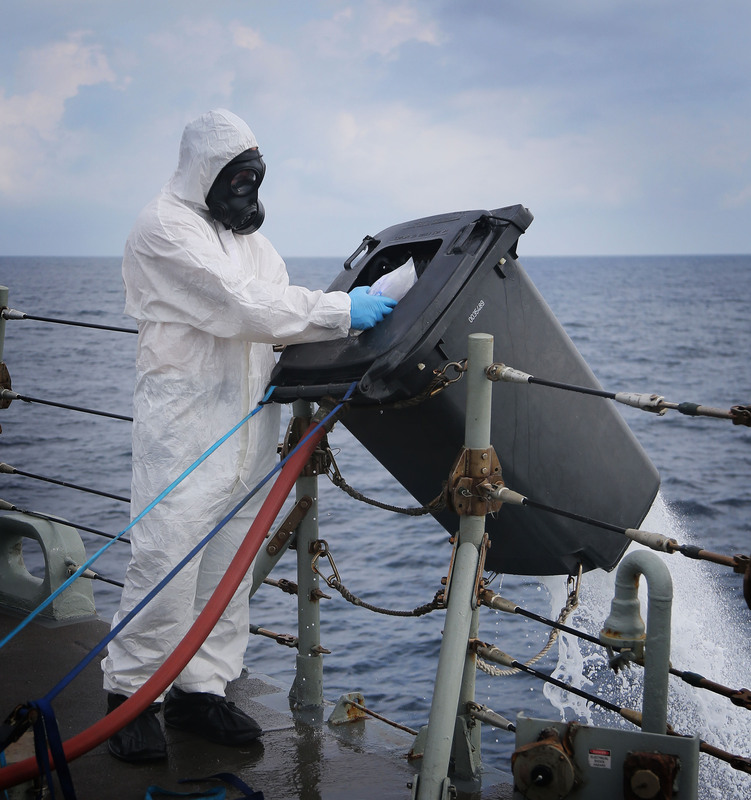 A HMAS Melbourne crew member disposes of illegal narcotics seized from a dhow in the Indian Ocean.